On Thursday, February 28, 2019, the Chester County Commissioners announced two key steps in their ongoing actions against Sunoco Pipeline LP - filing an intervention in the Flynn et al. v. Sunoco Pipeline LP proceeding before the PA PUC, as well as a notice of termination of two temporary easements on the Chester County Library property. On Monday, March 18th in the vicinity of Boot Road, Greenhill Road and Route 202 in West Goshen Township, work on the Sunoco Mariner II project began. PennDOT indicated that materials deliveries will begin on March 18th with Horizontal Direction Drilling (HDD) to start in the eastbound direction towards East Goshen Township on Tuesday, March 19th or Wednesday, March 20th with drilling to continue for 115 days. A second HDD drill rig is being delivered in the next 30 days for the westbound direction to West Whiteland Township. Once that drill rig begins, drilling will continue for 140 days. On March 11, 2019 Sunoco released its latest community newsletter. This newsletter and previous editions can be viewed on the Mariner East Project Page. On Friday January 25, 2019, the Chester County Commissioners submitted a letter to the PA PUC expressing growing concern with the lack of information and transparency being provided to the Department of Emergency Services and residents after repeated attempts of Chester County to obtain safety information relating to the Mariner East projects (specifically the most recent sinkhole) and not receiving the requested information from Energy Transfer Partners/Sunoco. Nearly 600 linear miles of pipeline corridors cross Chester County's landscape. Many of these pipelines have been in place for decades but, more recently, the construction of new lines and upgrades to existing ones have increased in the county. Much of the pipeline activity is a result of the expansion of gas extraction in the Marcellus and Utica Shale regions. The increased extraction has, in turn, created a greater demand for pipeline capacity to transport the resulting products. The Pipeline Information Center (PIC) was created to provide current information on pipelines and pipeline activity in Chester County. The Chester County Planning Commission maintains the Pipeline Information Center website and serves as the County's Point of Contact for interaction and information exchange with residents, landowners, operators, non-profits, and regulatory agencies. The website serves as a central location for information and updates on proposed and active pipeline projects. The Pipeline Information Center also supports pipeline safety and public awareness through a partnership with pipeline providers, regulators, and municipal governments. 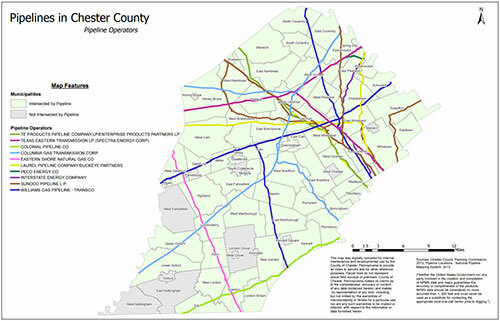 The PIC is designed to address stakeholders' primary concerns and includes sections such as an interactive map that allows users to search for their location relative to nearby pipelines as well as other mapping information; pipelines in the news which includes articles about local pipeline projects; and active pipeline projects which provides information on current pipeline projects proposed in Chester County. A full site index is available and provides a quick overview of the site's extensive contents.